the Way of Tea, has many seasonal events. 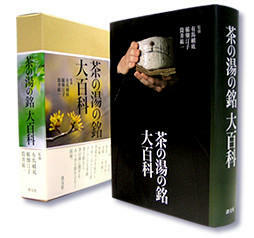 One of the authors is Inahata Teiko, the Haiku Master. seasonal items, month by month. He was also a recognized haiku master, and the book includes many haiku, with somewhat awkward translations. 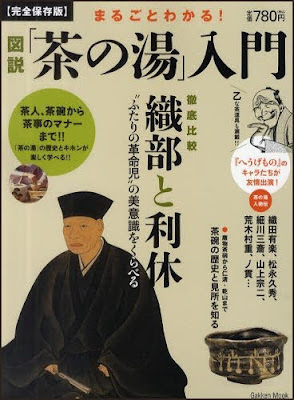 Unlike the Japanese book cited above, this one is less concerned with universals of chado, more with one specific person's approach to it all. 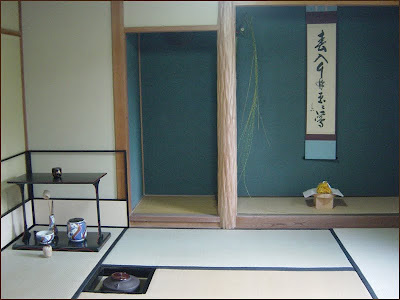 The Japanese tea ceremony is usually celebrated is a separate room or house, the Tea Ceremony Room, chashitsu 茶室. This tea room of the temple Ginkaku-Ji in Kyoto is said to be the first of its kind in Japan. Shogun Ashikaga Yoshimasa (1436-1490) ... and more about this place.
. Kyoto - Higashiyama Culture . 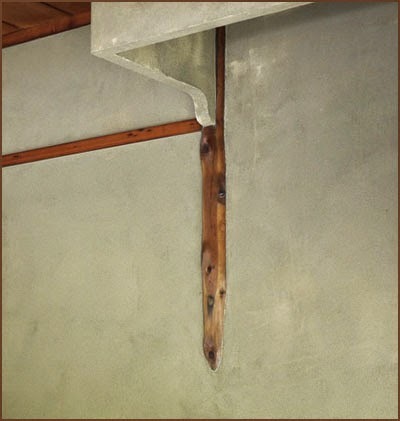 The corner pillar of the host's mat is partly hidden.
. tsumayooji (tsumajoji) 爪楊枝　toothpick . Teacups chawan 茶碗 are very important in the tea ceremony. --Sarah M. and Natalie C.
. Tea cups and pots - Dragon Design . To keep the lid of the water kettle off the floor. This small item made of various materials, including porcelain, bamboo or carved wood. To give it a seasonal touch, in winter a pine cone is used, in summer a butterfly. CLICK for more LINKS !
. Tea Kettles 茶釜 chagama .
. chasen 茶筅 / 茶筌　/ 茶せん tea whisk . The cakes bring the seasons into the tearoom. Their names are also made to reflect the season and to show the poetic associations of olden times. Many are named after famous poems. 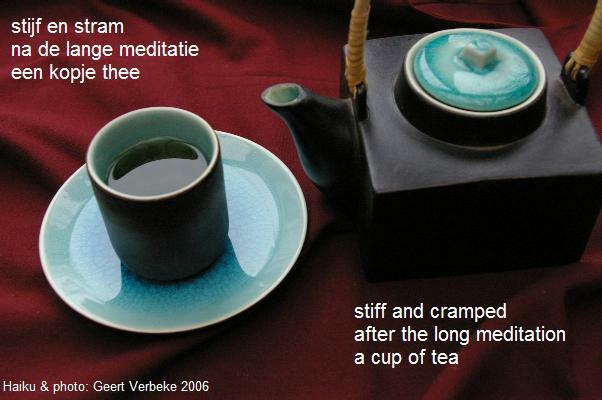 The place of tea time in England, tea ceremony in Japan, gongfu cha in China... show that tea is more than a drink. It's a social activity. One that let's us exchange and share a common feeling with friends, family or even strangers. "Was ist der geheime Hintergrund für die Verwendung des Furo im Sommer und des Ro im Winter?" "Ruf im Sommer das tiefe Empfinden einer kühlen Frische und im Winter das einer geborgenen Wärme hervor. Leg die Holzkohle so, daß sie das Wasser richtig erhitzt und bereite einen Tee, der erfreut - das ist das ganze Geheimnis!" First tea ceremony of a new year. 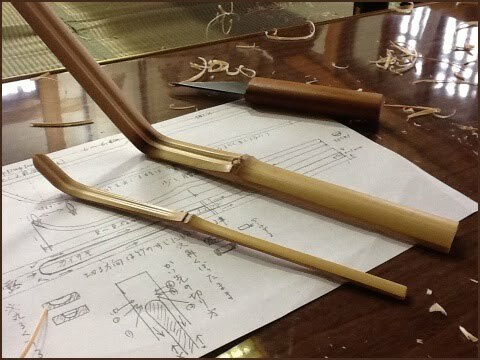 A new scoop is carved and used at the first tea ceremony of the year. First tea ceremony of the new year. Using the first well water (wakamizu) and heating the hearth for the first time. A quiet ceremony for the tea master and his family.
. Good Health (Luck) Tea, fukucha　福茶 .
. First drawing of Well Water (wakamizu 若水) .
. 蓬莱山 Horai San (hoorai san). akatsuki no chaji 暁の茶事 "dawn tea ceremony"
A tea ceremoniy held in the coldest season of the year. It starts at 4 a.m. and the participants enjoy the dawn of the new day. It starts with candle light and slowly things become more visible as the day breakes and light comes through the small windows.
. Rikyuu Ki 利休忌 Rikyu Memorial Day. Memorial ceremony of the death day of Sen Rikyu. The Tsurigama is a slightly narrower kettle which is hung from a chain exactly above the Ro charcoal pit. The Kan rings are different from those used when removing a normal Kama from the fire. The chain, the rings, and the handle are available for reasonable prizes to extremely expensive sets with a name made by famous smiths and come in their own box.
. "sweet tea", amacha 甘茶 (あまちゃ) . eighty-eighth day from the beginning of spring. The Haiku Summer starts in May. The furo brazier is used from May to November. asacha 朝茶（あさちゃ）"tea in the morning"
Tea ceremonies held in the cool hours of the early morning, beginning at 6, before the heat of day begins. Light refreshments are served with the tea. Tea masters especially in Kyoto would go to a famous well to scoop water. They use a special purified wooden container to transport the water. The pattern will bring a feeling of coolness. In olden times, girls dressed in special kimono and headgear would go out to pick the tea leaves. Click HERE to look at photos. The head of the Urasenke Tea Ceremony, Sen Soshitsu (Sen Sooshitsu)　裏千家の家元、千宗室, talked about ways to stage the coolness, for example using a large fresh green leaf as cover of the water container (habuta　葉蓋) or wringing the little linen cleansing cloth in a way it produces the fresh sound of clear water (arai jakin 洗い茶巾). The intention is to create an aesthetically cool feeling, not to physically cool anything. Sen Soshitsu about Stageing of Coolness in the Tea Ceremony.
. Koorin-ki 光琳忌 Korin Memorial Day .
. Oribe-ki 織部忌 Oribe Memorial Day .
. Kenchabune 献茶舟（けんちゃぶね） boat for ritual tea ceremony . Each participant has to put one flower in the vase for a flower arrangement. The vase is then placed in the tokonoma. The flower arrangement has to match the hanging scroll theme. The vase is usually made of bamboo with a cut at the top. The Haiku Autumn starts in August. Hassaku-gama 八朔釜 Tea kettle used at the Hassaku ceremony. 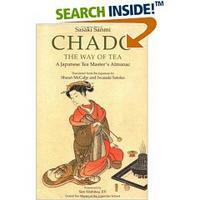 Kado-cha 門茶 "tea at the gate"
From the first of the 7th lunar month to the 24th. Tea is prepared at the gate and given to monks and pilgrims. Sometimes a full tea ceremony with food is given as alms.
. o-settai, settai 摂待 giving alms to henro pilgrims . Abt Koogetsu Soogan 江月宗玩 (1574 - 1643), temple Daitoku-Ji 大徳寺.
. Different types of Green Tea from Japan . Furo-nagori　風炉名残 "parting with the furo"
At the end of autumn, the last tea of this year is drunk in rememberance of the warmer season. Now the winter will soon start. At the end of October, the furo 風炉 is put away and replaced by the ro 炉. A special tea ceremony is held to part with the hearth for the next half year. A tea ceremony on the anniversary of the death of the tea master Sen Ichio Soshu 一翁宗守 （1593～1675, the fourth generation from Rikyu. He was the founder of the tearoom Kankyuan 官休庵(Kankyuu-An). irori hiraki 囲炉裏開く（いろりひらく）"opening the open hearth"
The hearth 炉 is opened for the first time since April. Tea for this cereomny is prepared with tea powder made from leaves freshly picked that summer. This hearth, ro, will be used from now until the following April. a square hearth protection. Some of famous temples are decorated with laquer and inlay. It used to be the 30th day of the 9th lunar month. Tea leaves picked in early summer are packed inside jars and mature until November. Now the jars are opened (kuchi kiri : open the mouth of the jar). The leaves are then ground into powder for powdered green matcha. At this tea ceremony, the tea is prepared using the first fresh powder.
. kuchikiri ni Sakai no niwa zo natsukashiki . Preparations for welcoming the new year begin. Greetings for the year end are made on this day. Around December 11. On New Year's Eve (joya), the family and close students of a tea master drink the final tea of the year in the tea master's home. The fire built at this time is used for the first Obukucha the following year on the next morning. Thus the tradition is continued from one year to the next. 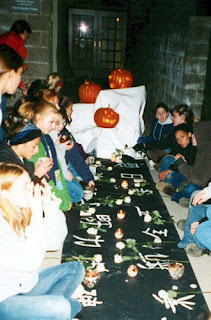 Yobanashi no chaji 夜話の茶事 "Talking at nightfall"
Tea ceremonies are held in candlelight from nightfall until evening. Food is served and the cold and maybe snow can be enjoyed. It starts at 6 o'clock. Daruma san, だるまさん　達磨さん、 the Indian Monk Bodhidaruma, practised Zazen for long hours. When he got sleepy, he cut off his eyelids and threw them away. Later he found a plant had grown out of them. He collected the leaves and brewed the first tea ... says the legend. Daruma is closely related to tea for this reason !!! Here is a special online museum for Daruma san only. Matsuo Basho was very fond of Naracha rice gruel served at Haikai Meetings.
. wabite sume tsuki wabisai ga Naracha uta . (The essence of) chanoyu (may be found) by (the contemplation of) these (images): the ume and the kan-giku; the scattering of the colored leaves, the (vitality of) green bamboo, and (the solitude and silence of a) leafless tree (in the depths of winter); the frost at dawn. with ALL of you ! Isn't the Internet a great place ! Click HERE to see my teapot philosophy ! This is a series ... or is it? Couldn't resist writing these, had so much fun! Your pages are encycropedia of Tea that included all about Tea affairs. Kanso (簡素) Simplicity or elimination of clutter. Fukinsei (不均整) Asymmetry or irregularity. Yugen (幽玄) Profundity or suggestion rather than revelation. Datsuzoku (脱俗) Freedom from habit or formula. Seijaku (静寂)Tranquility or an energized calm (quite), stillness, solitude. Opening a container of new tea is a winter expression. Issa suggests a connection between his domestic action (opening the tea container) and the migration of wild geese in the sky above. became a tea master under the 7th generation head of the Omotesenke line, and eventually set up a tea house in Edo (Tokyo), where he devoted himself to developing the Omotesenke style of the Way of Tea in Edo.